Want it by Tuesday 23rd April? Order within 3 days, 21 hours, 47 minutes and choose Next Day Delivery at checkout. 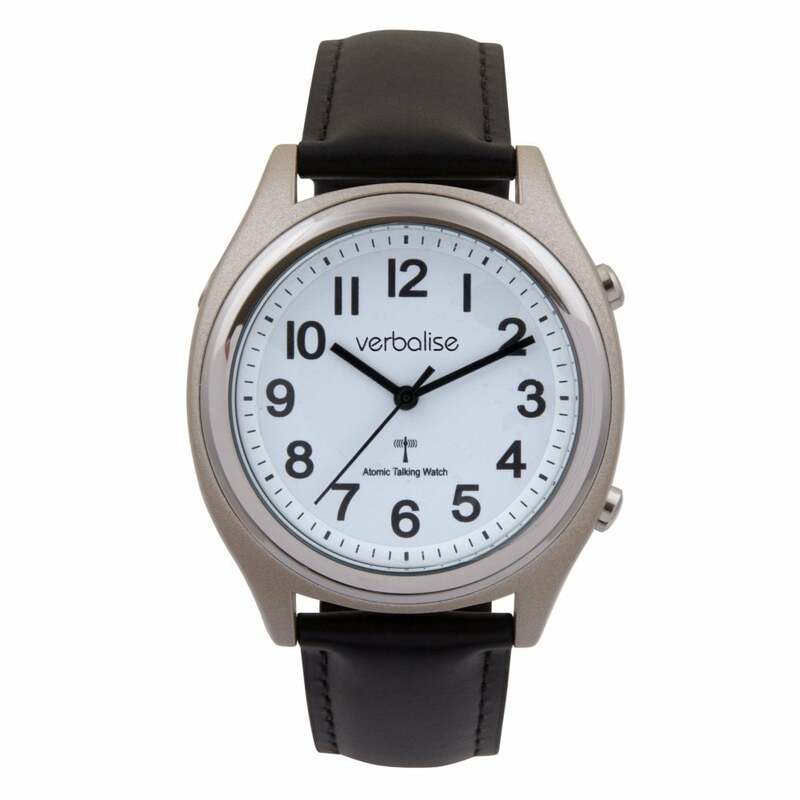 This Verbalise talking watch - with a metallic coloured resin case and a chrome ring around the white face containing black contrasting numbers and hands - has a case diameter of 39mm and announces both the time and date in a male English voice. It also has an alarm and optional hourly announcement function. Just press the 2 o’clock button to hear the time and the 4 o’clock button to hear the date. It is radio controlled, which means it receives a signal from a radio transmitter, enabling the time and date to set and regularly update automatically, including when the clocks change. The only time it needs to be set manually is when it needs a new CR2032 battery. You can set your watch to receive either the UK, Germany, USA or Japan time signals which means it will automatically update when you visit these countries. If you are outside these countries, you are also able to set up the time manually although the date facility is not available. It is fitted with a black genuine leather strap but alternative straps are available on request.